Reticulates python from Southeast Asia and is the longest snake in the world. Although they are not venomous, but they are dangerous animals. Their power is enough to kill an adult male. Green anaconda from South America. Green Anaconda is the second longest snake in the world. Green anaconda is the largest snake in the world. India Molurus Python or Python or python Black tail comes from south Asia and Southeast Asia. In Southeast Asia, India Rock Python popular as the Burmese Python. The color is usually lighter than the Indian python. Morelia spilota or commonly known as Diamond Boa Python is a snake that comes from coastal areas in South Australia. Diamond python like to stay in high altitude areas. King Cobra is a venomous snake and one of the longest in the world. 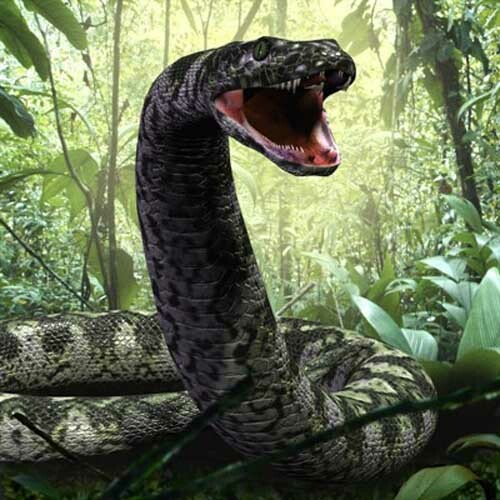 Although the snake is slimmer than Boa, King cobras have a strong poison that can kill quickly Boa. King Cobra has a neurotoxic poison in high doses. They eat other venomous snakes python and they are also animals that eat cannibal king cobra others. They also can kill other animals such as cattle or an elephant. But their large size makes the King Cobra is difficult to swallow a buffalo or elephant. Boa Constrictor is large and heavy Boa. This is one of the Boidae family originated in South America, Central America and North America through the Caribbean. The color of their skin depending on the locality. Some have dark color, but some others have a lighter color. Brown snakes are available in different species and originating from Australia and North America. Although venomous brown snake, the venom is not strong as the Bushmaster, king cobra or a rattlesnake. Snake Diamond is available in 3 species (eastern diamondback, western diamondback, diamond snake back and red) all of these venomous snakes and deadly. Eastern Indigo Snake is a snake of blue-black or reddish orange and is a non-venomous snake. Snakes are often the victims of venomous snake hunter. Most of the list of longest snake in the world is the snake that is almost extinct. They continue to be hunted by humans, so we have to keep them alive.